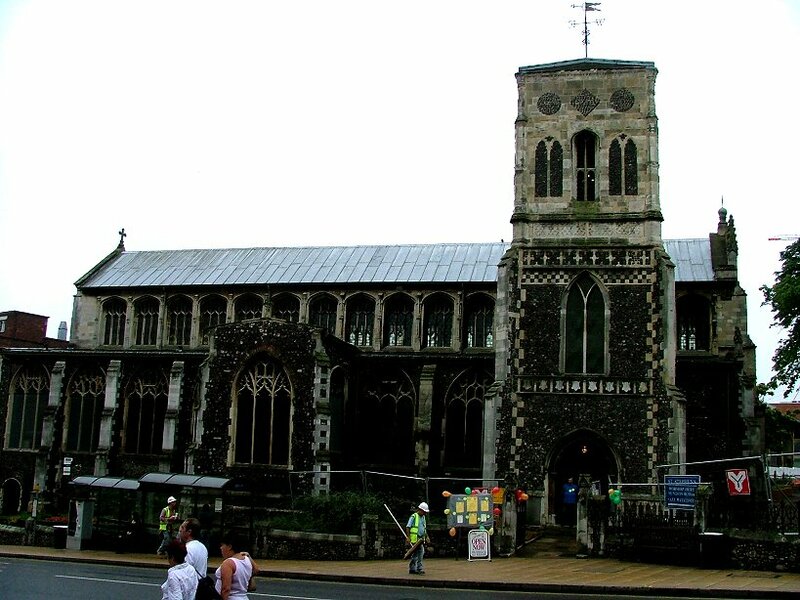 St Stephen is the odd one out of Norwich's big medieval churches, a great sprawling beast unkempt on its sloping site, with none of the precision and politeness of St Andrew or St Peter Mancroft, or the identikit smaller churches whose parishes pack central Norwich like Larkin's squares of wheat. 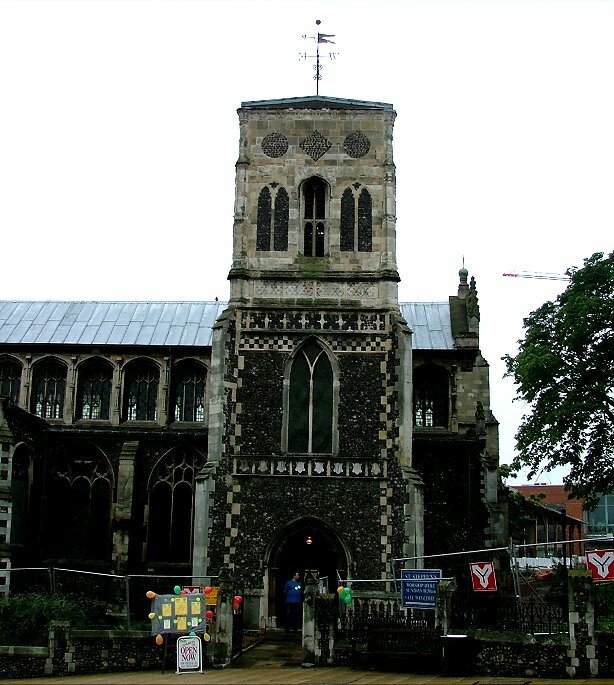 The offset tower, forming what is effectively a three-storey porch at the west end of the north side, is unique among larger medieval churches in East Anglia, and by the time you get to the east end of the north aisle, there is so much below floor level that the aisle is virtually two storey. The elaborate transept, and the stone facing of clerestory, chancel and tower, give a sense of a building that has been cobbled together, a vast labyrinthine structure out of the pages of Gormenghast, perhaps. I had been trying to get inside St Stephen for a long time. Unusually for a large medieval church in a city centre, it was never open - or, hardly ever, because I got inside eventually. 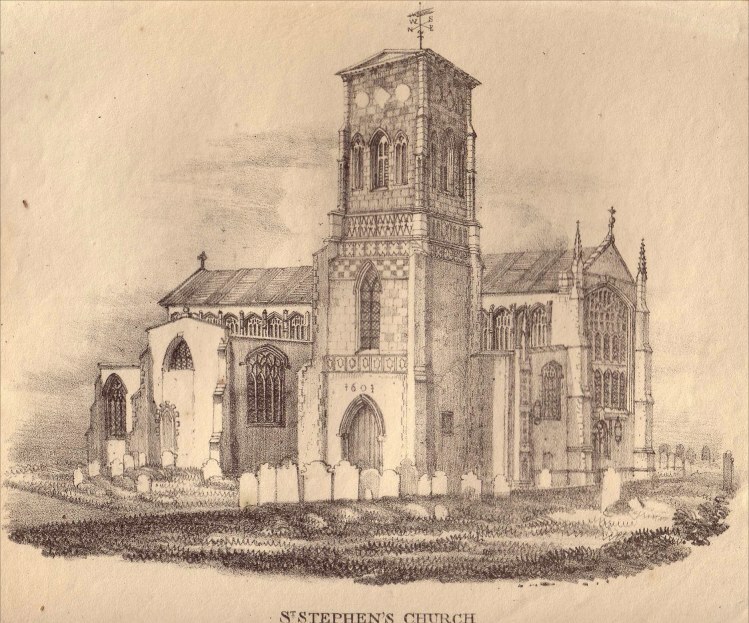 When I did, it was to see St Stephen in its last days, but more about that later. I have since discovered that St Stephen is now open every morning from 10 am to 12 pm, an enormous leap forward for a church that was locked out of sight for years, in a city where far too many churches are closed to pilgrims and strangers. 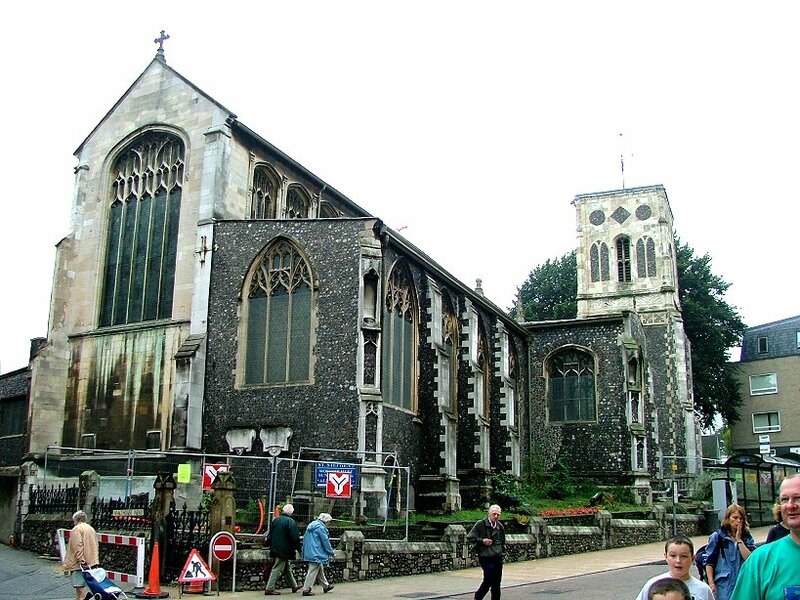 That St Stephen finds itself with a bigger public profile now is mostly because it sits at one of the entrances of Norwich's new massive identikit shopping mall, the Chapelfield Centre, and its graveyard has become a walkway to the doors. You step down into the porch, which is long enough for its vaulted ceiling to have two splendid hagiographic bosses at its junctions. 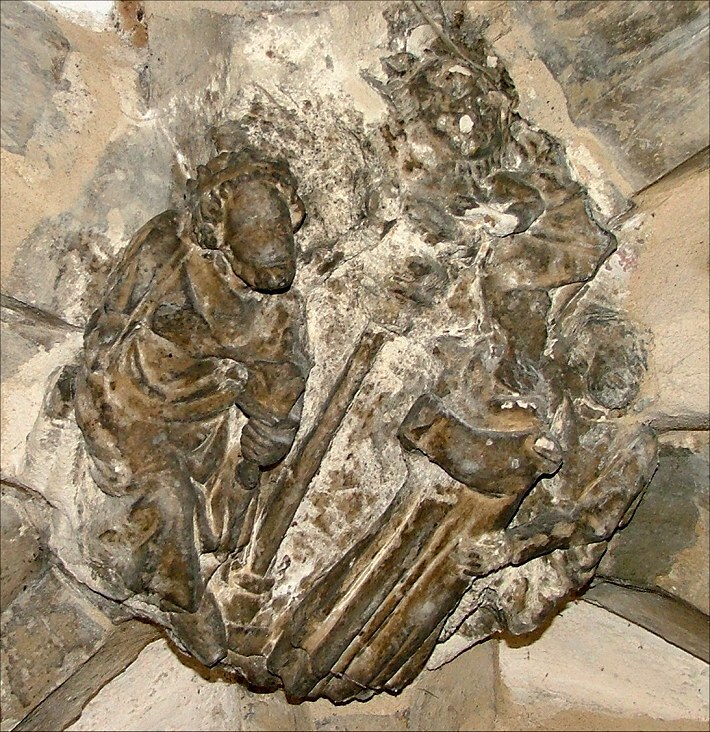 The first shows the martyrdom of St Stephen, two figures above slamming large stones down onto the unfortunate proto-martyr's head. The other is more curious; a figure on the left wearing a crown or possibly a martyr's laurels holds his cloak, while on the left a man reaches around to pull a woman away from a massive devil standing at the top of a pillar. Because St Stephen is so often paired with St Laurence, this is generally assumed to be St Laurence - but doing what? 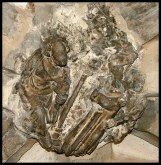 A Saint grasps his cloak in the same gesture on the screen at Aylsham. 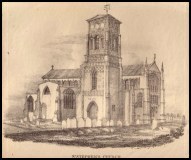 There was a church here in the 14th century, and the ground plan was probably similar. What we see today externally is almost all the work of the early 16th century, a large late medieval church on the eve of the Reformation. 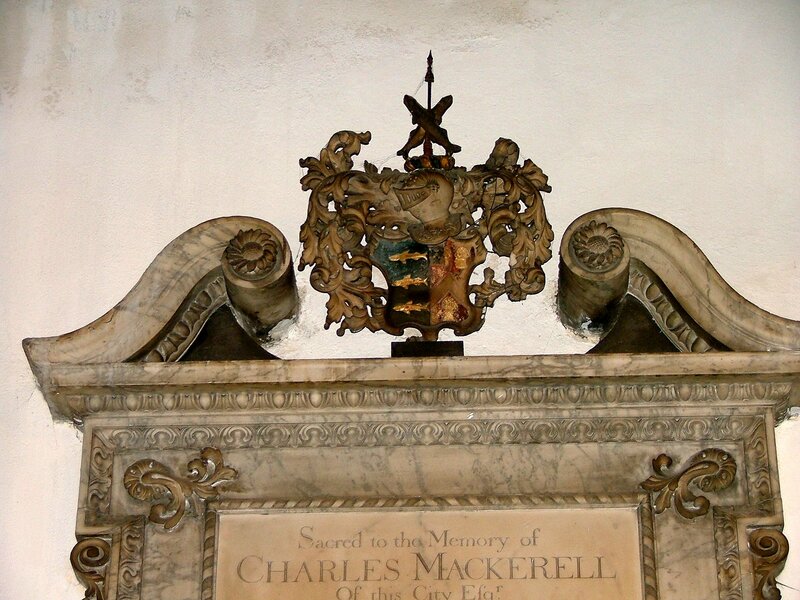 Indeed, there is some evidence that the nave was not finished until the reign of Edward VI, which may explain why they stopped putting angels on the hammerbeam corbels. The curious detailing on the tower is probably the result of a remodelling in the early 17th century. You step inside to a fairly gloomy interior, but as your eyes become accustomed to the light there is inevitably a comparison with another very late medieval church of similar size, Lavenham in Suffolk, particularly in the tracery of the arcades. There is no break between the nave and chancel, a fine hammerbeam roof stretching away into the distance. Next most striking is the huge range of memorials from the 17th to the 19th centuries that flank the aisle walls, set between the windows. Some of them are simply vast, reaching up to the roof. Mostly they are to local worthies, and it is no surprise that such a central and prominent parish has provided many mayors of the city. 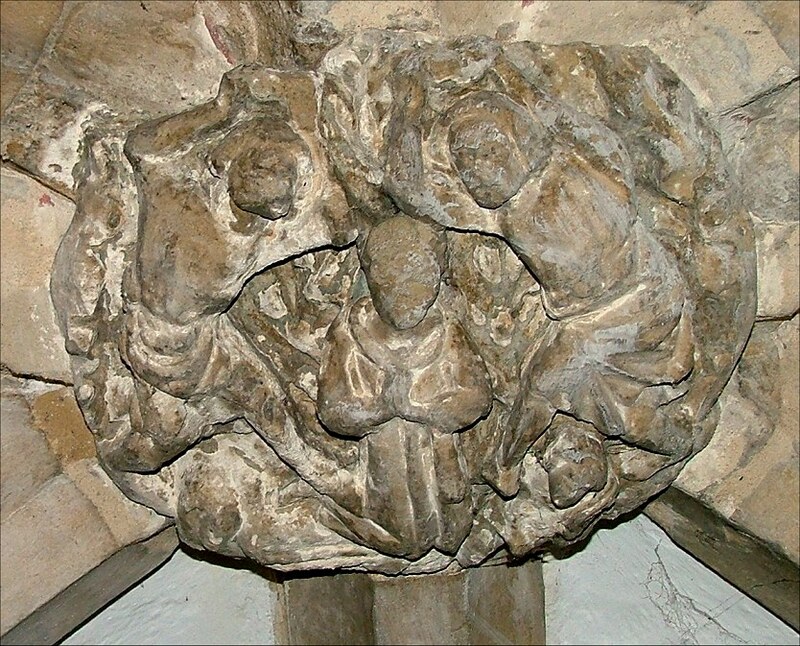 The proximity of the hospital meant that this also came to be regarded as the doctors' church, and several of the tombs have medical imagery - snakes and staffs, and the like. 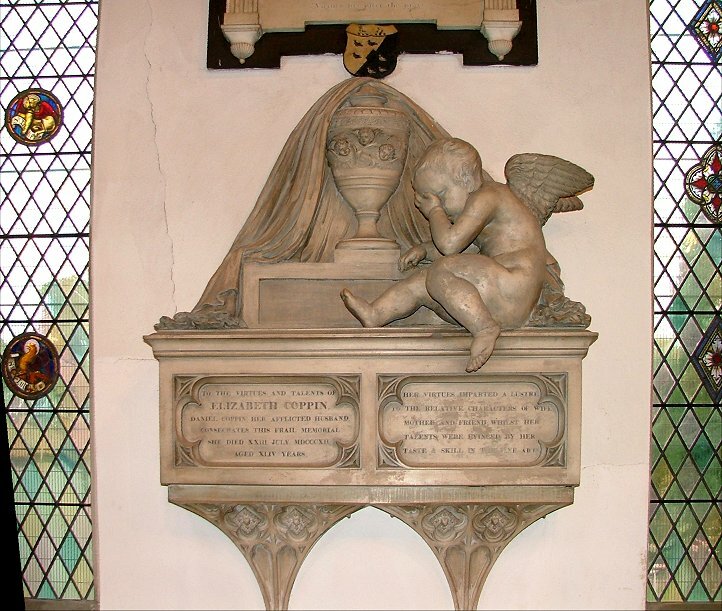 I am told that memorial spotters come especially to see Elizabeth Coppen, who died in 1872; her memorial is the only one in Norfolk that is made out of Coade stone, an artificial substance invented in the 18th century. St Stephen has the advantage over Lavenham that most of the glass is 20th century and very good, whereas Lavenham still has a preponderance of dull 19th century glass. Mind you, Lavenham did not have the benfit of a WWII blitz. What Lavenham also escaped was a wholesale restoration by Diocesan architect Richard Phipson in the 1870s. Phipson was not a bad architect, but he tended to observe the letter of medievalism rather than the spirit. 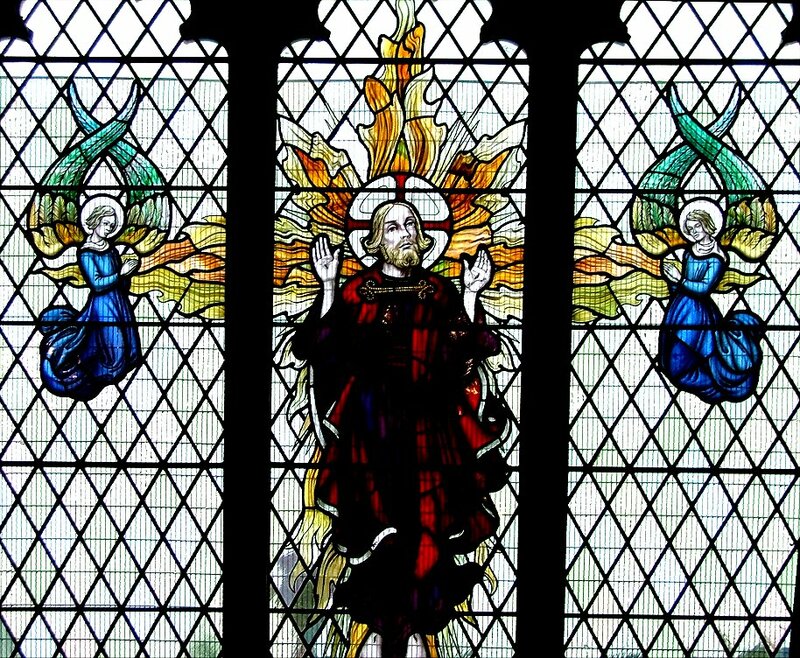 When he is good, as at St Mary le Tower in Ipswich, he is very good. 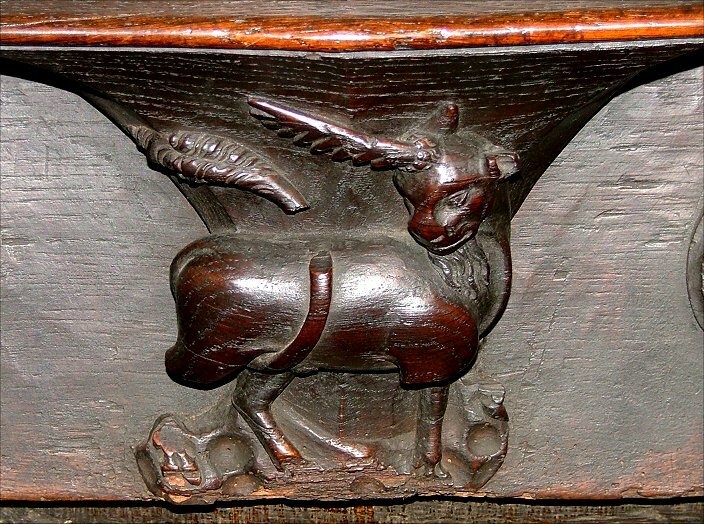 But most often his work is fairly dull, as it is here, especially the woodwork; range after range of long identical poppyhead benches, and a grim pulpit. 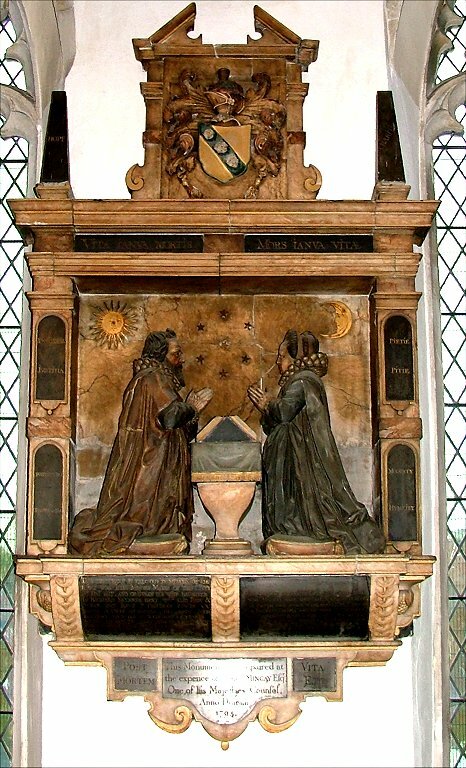 The reredos, howver, probably predates Phipson's time, and its survival may reflect the low church character of the parish. This may explain why Phipson was less exciting here than he occasionally was elsewhere - he liked to design for high church worship. But there are some enticing medieval survivals, not least the four stalls now standing at the east end of the nave with misericord seats. 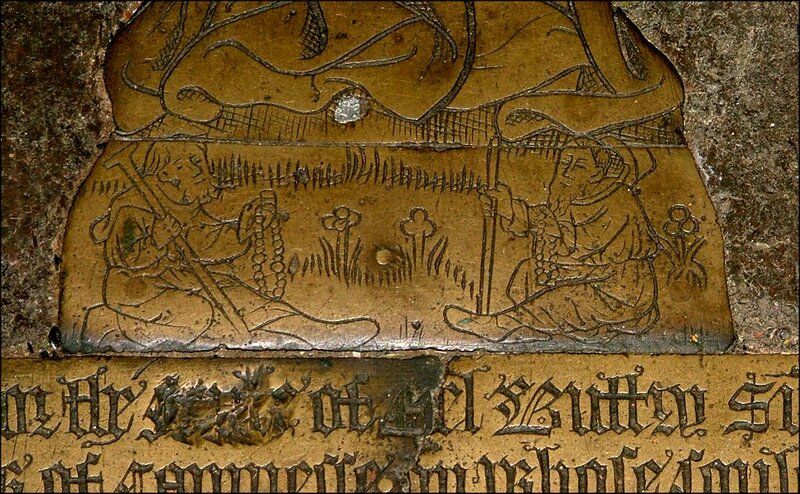 And St Stephen's great treasure is its range of brasses. 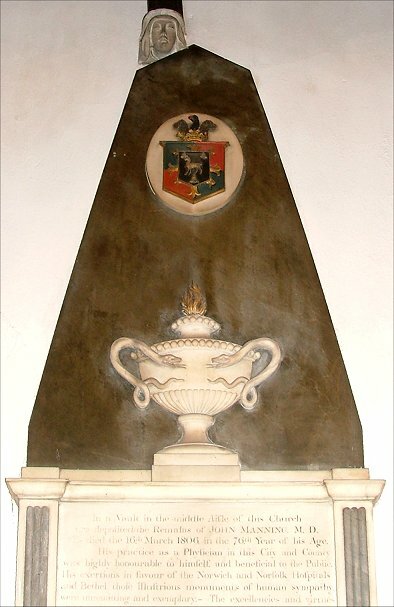 There are no less than nine fine figure brasses, including several pairs. The loveliest is set in a little box under a cover behind the organ. The floor has been raised here, but you can take off the trapdoor and see beneath it a pretty little brass of a lady. 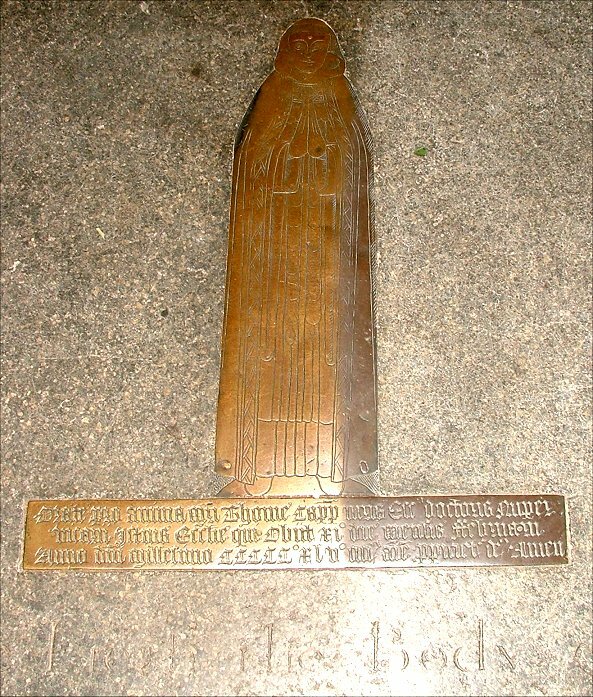 Curiously, the inscription tells us that it is Elenor Buttrey, last Prioress of Campsey Ashe Abbey in Suffolk, but I don't think that can be right. 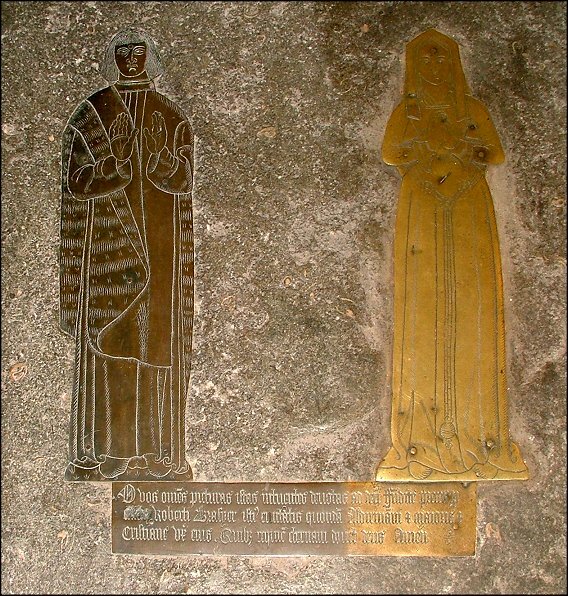 The figure looks at least a hundred years earlier (Prioress Buttrey died in 1547, at the start of the ultra-protestant reign of Edward VI) and in addition to the style of her dress, there are two little pilgrims sitting on the ground at her feet, telling their rosaries. It is exquisite - the detail is the image to the right; click on it to enlarge it. 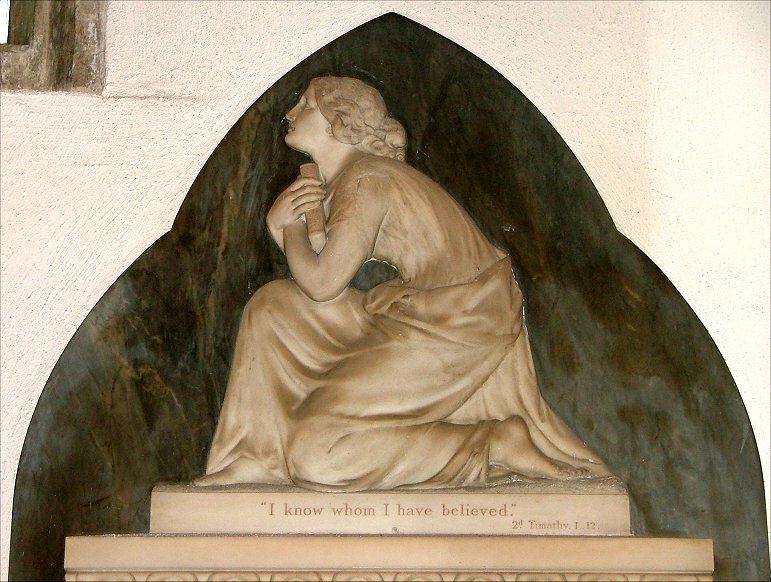 This would have been anathema to the early Anglicans, and so I think that this inscription and figure did not originally belong together. The inscription is also Catholic in character, and so may date from after 1553 and Mary I's time - this inscription has also been vandalised (the 'pray for the sowle of' clause hacked out) but this was probably by the puritans a hundred years or so after the Reformation. 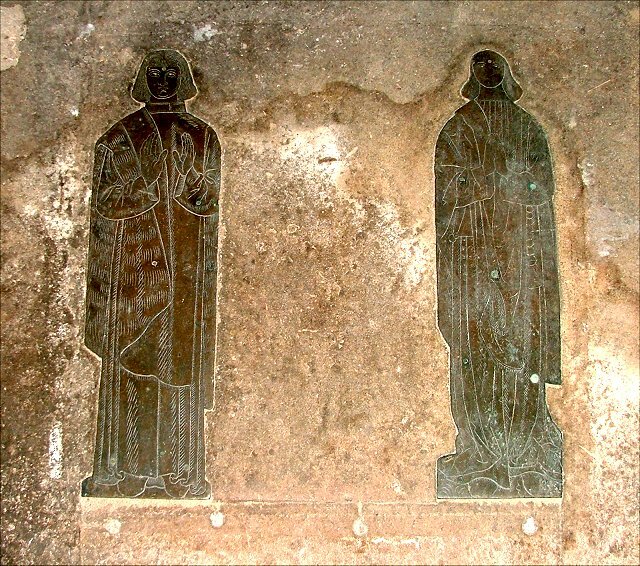 Other brasses are to members of the Brasyer, Cappe and Mingay families, who provided mayors of Norwich in the 15th and early 16th centuries. 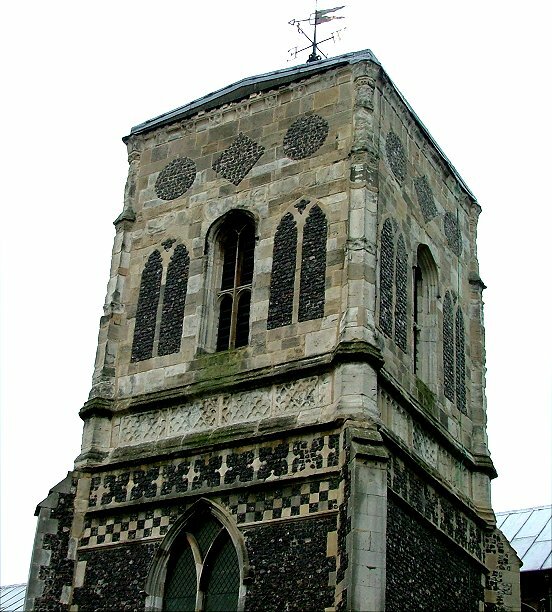 The Brasyers are famous in bellringing circles because they owned Norwich's main bell foundry, and produced many East Anglian bells that are still rung today. The figures are set in the sanctuary and at the far west end of the nave. 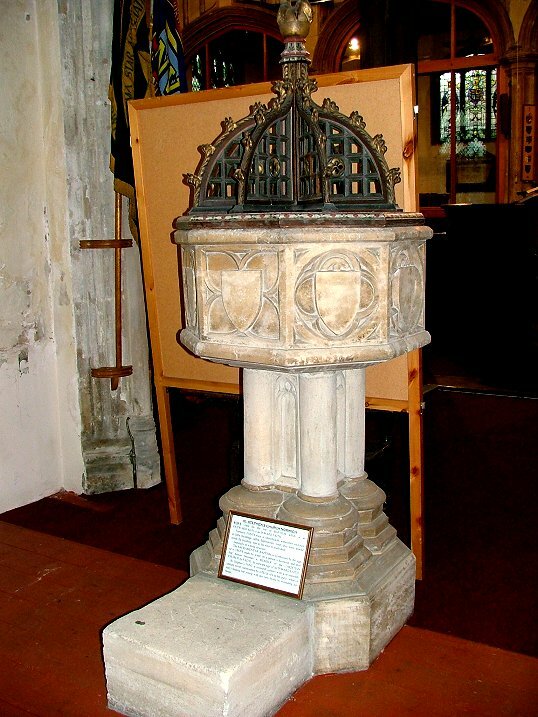 Phipson reset the font at the entrance to the north transept, creating a kind of baptistry. This is now the setting for one of St Stephen's fine 20th century windows. 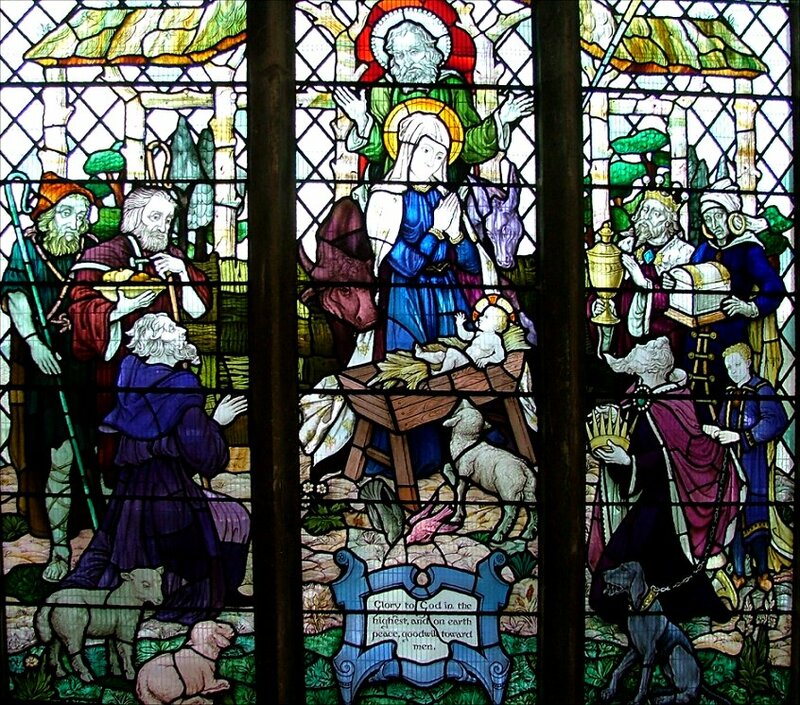 In the early 1950s, Alfred Wilkinson created a sequence of scenes from the life of Christ that are set here and in the south aisle. 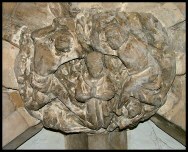 This was the first, and depicts the nativity. 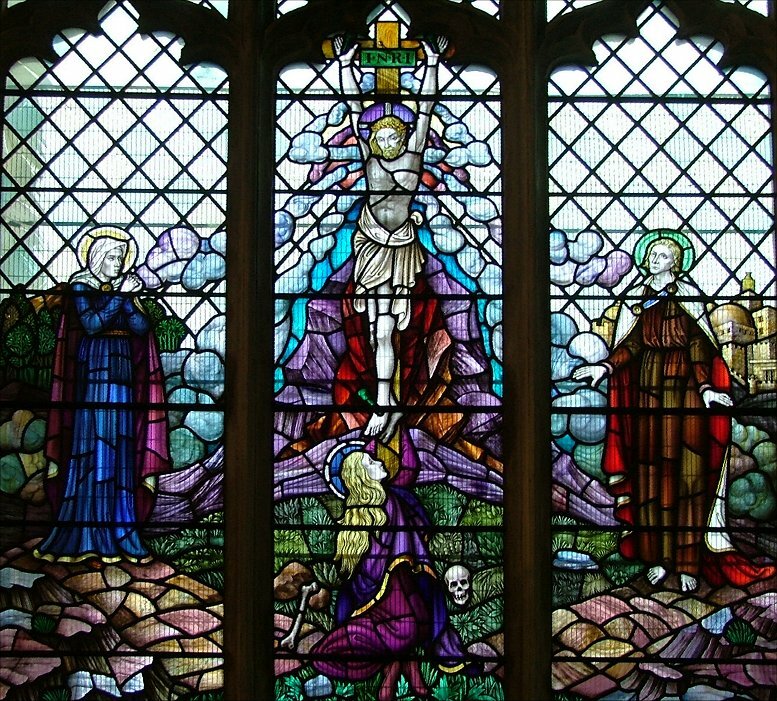 In the south aisle are the crucifixion and the resurrection, and all three are worthy of attention. 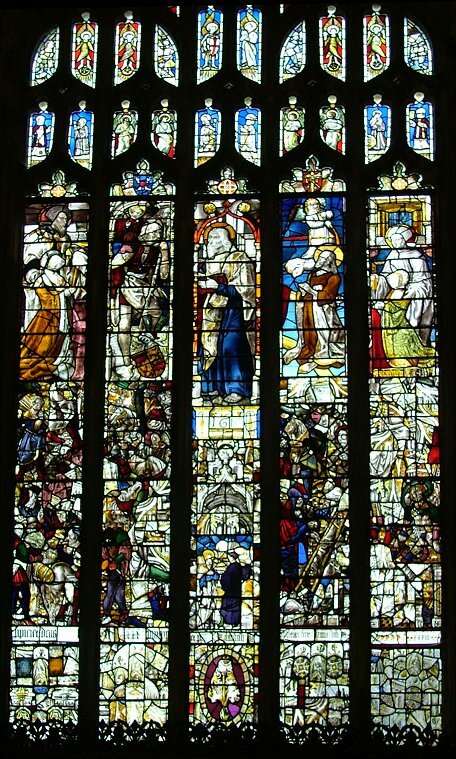 Wilkinson may also be responsible for the war memorial window, which includes a depiction of Norwich Cathedral. 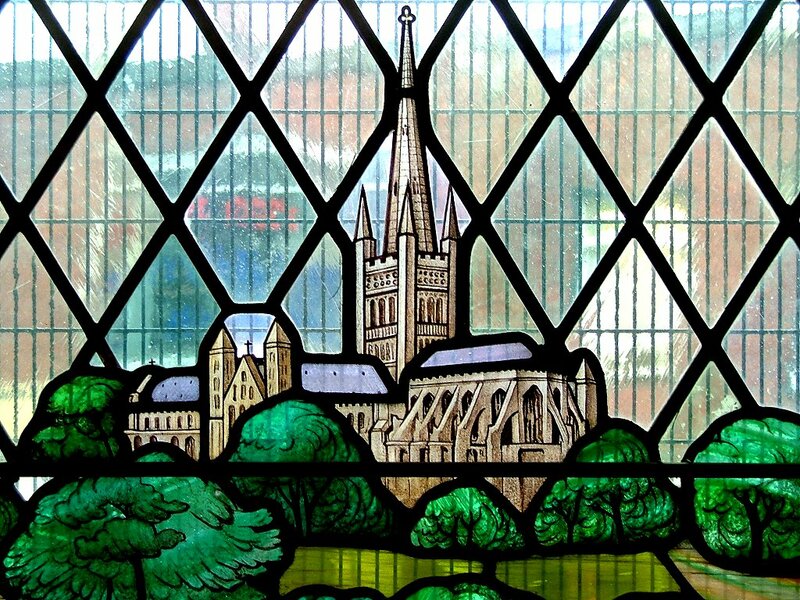 There is actually a fair amount of medieval glass in the vast east window, but it is mostly fragmentary, and mixed in with later continental glass and some 19th century glass. The overall effect is quite pleasing, though. It was all removed during the war, which is why this window did not suffer the fate of the windows in the aisles and at the west end. As I said at the start, I finally got into St Stephen to discover that the building is in its last days, at least in its present form. It is about to undergo a massive reordering. All of Phipson's furnishings are to go. 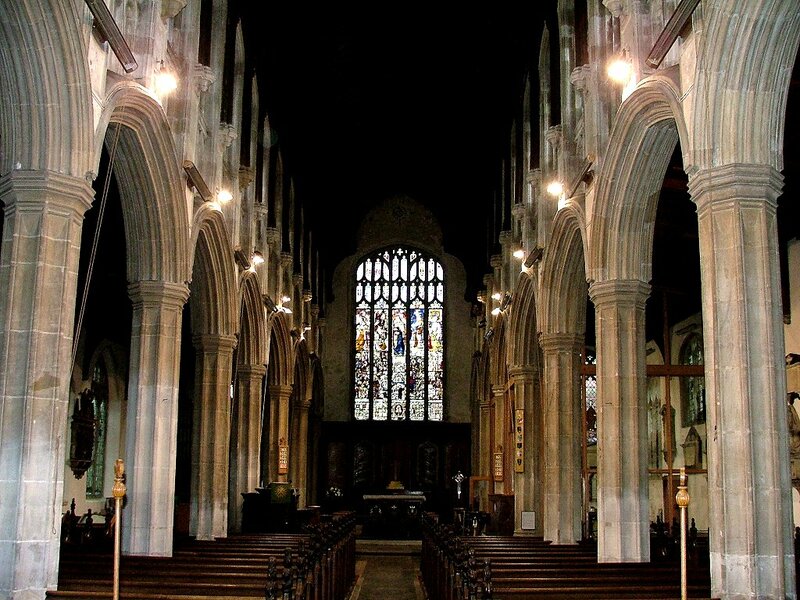 The nave is to be converted into an activity area, and the west end will have kitchens, toilets and the like. 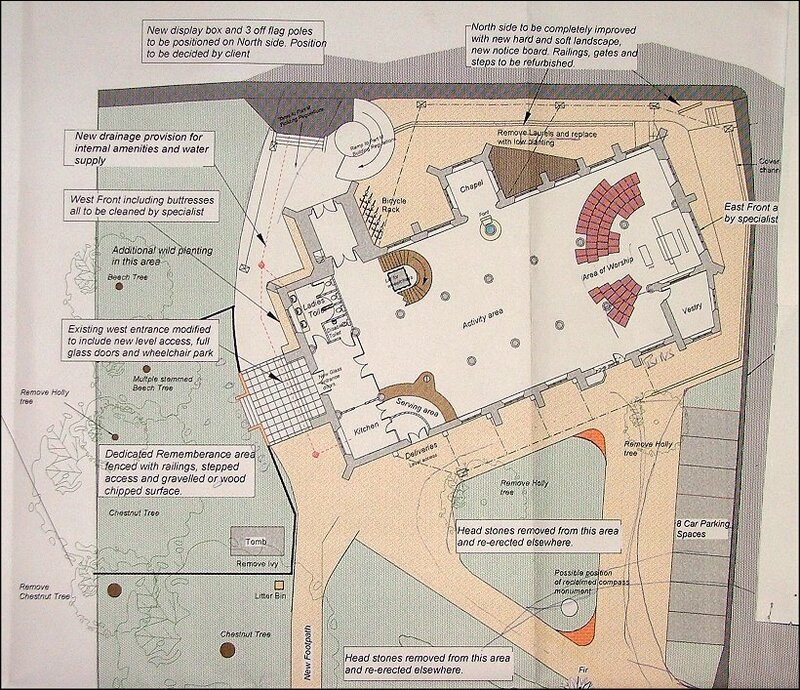 A new 'Area of Worship' will be built into what is now the chancel, a semi-circle of chairs facing into the sanctuary. 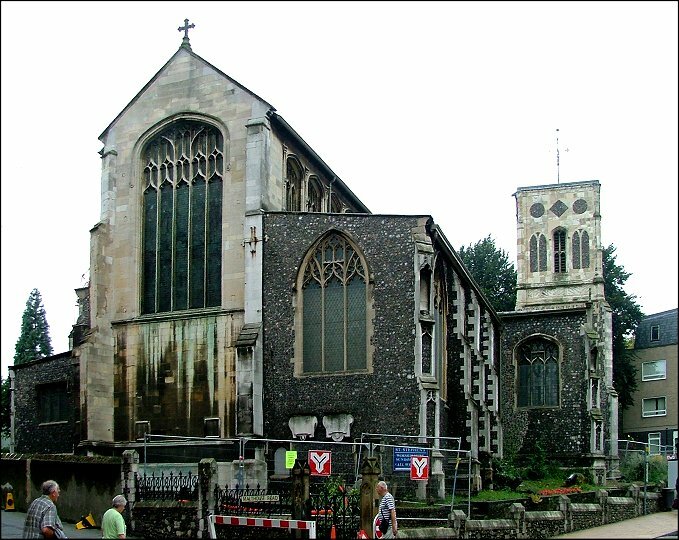 Outside, the parish planned for most of the gravestones to go, and the area to be landscaped and given over to car parking, but I am pleased to learn that Norwich planning committee have rejected this; most gravestones will be retained. You can see a plan to the right. The interior changes will still be drastic, but it is hard to pretend that St Stephen had much more to offer in its present form.